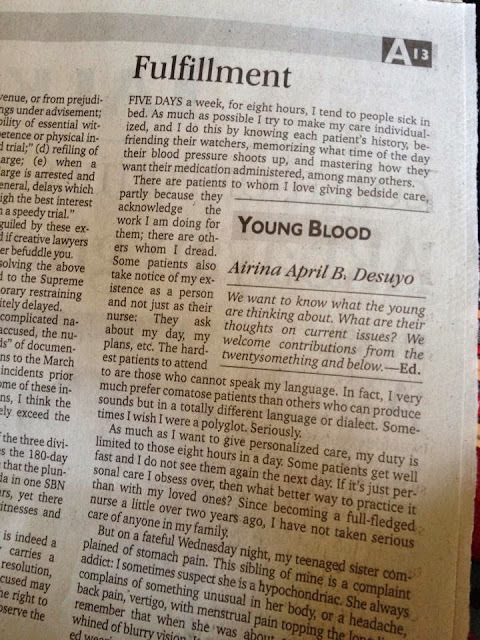 Young Blood is a column of the Philippine Daily Inquirer that signifies the voices of the twentysomething and below. Since finding myself in love with Journalism, I have always wanted to contribute to this space in the newspaper’s opinion page. Every time I write articles in this blog, I immediately send the same article to Young Blood’s email. Luckily, last year 2011, my article about my very first salary came out in this column. Did I already write luckily? Because luckily, I got published again! My sister’s appendectomy story came out on a last Sunday’s issue. I have no idea if there is a thing as ‘Sunday Special’, but I choose to believe there is. A lot have been edited in the article, including the title. But who cares? I’m on national paper and my ultimate dream lives on. Thank you Lord. The unedited article is right here.